"I get my own pumpkin pie cookies? You really love me!" 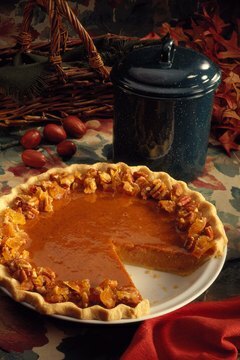 You spent hours in the kitchen making pumpkin pie. Smells filled the air and now your lovable pooch is giving you the droopy eyes, begging for a slice. Unfortunately, the sugar in your pie is a bit too much for your dog. However, with a few changes, you can make him nutritious pumpkin pie biscuits. Pumpkin comes packed with the antioxidant beta-carotene, which provides a source of vitamin A for your dog. In addition, pumpkin provides a good source of fiber for your dog’s diet, which aids in digestion and helps move the poop. For basic pumpkin pie biscuits, you will need 1 1/2 cups whole wheat flour, 1 cup rolled oats, 2 teaspoons baking powder, 1 teaspoon cinnamon,1 teaspoon ginger, 1 teaspoon allspice, 2 tablespoons canola oil, 1/2 cup pumpkin, 1/4 cup peanut butter and 1/4 cup water. If your dog has wheat allergies, substitute rice flour for the wheat flour. 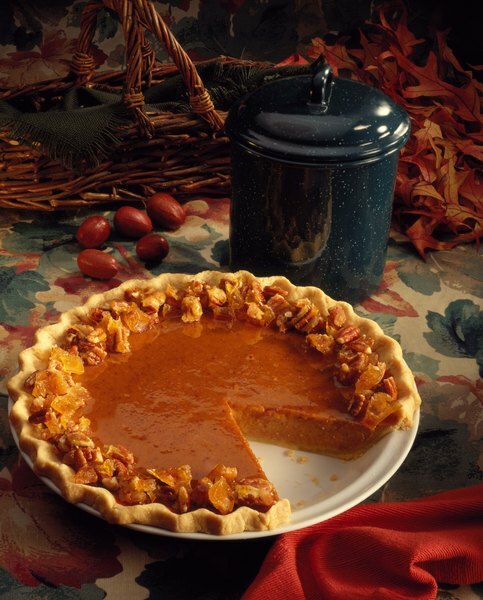 For the pumpkin, you want real pumpkin and not pumpkin pie filling. The spices are not necessary for your dog. He will love the treats with or without, but they do make the kitchen smell nice. Preheat your oven to 325 degrees and grease a baking sheet. In a large bowl, combine flour, oats, baking powder and spices. In another bowl, combine the oil, pumpkin and peanut butter. Mix until well blended. Combine the wet and dry ingredients. This will be a thick dough mixture and may be hard on a hand mixer. Consider using a stand mixer or mixing by hand. Slowly add the water and mix until thoroughly combined. Turn the dough out onto a floured surface and roll to 1/4 inch thick. Use cookie cutters to cut out your desired shapes. Place the biscuits on a baking sheet and cook for 12 to 15 minutes. Turn off the oven, but leave the pan in the oven with the door slightly ajar for at least 30 minutes to completely dry out the treats. Cool on a wire rack. If your dog doesn’t manage to gobble all the treats up, store them in an airtight container for two weeks. If you make a large batch, freeze some for later use. Remove the treats from the freezer and thaw them before feeding them to your dog. Consult with a veterinarian before adding new foods and treats to your dog’s diet. Remember these are treats and should be given in moderation. This will be the tough part because your pup will be begging for more. What Happens Surgically When a Cat Gets Spayed? How Does Ammonia Affect My Saltwater Aquarium?